The measurement of impurities at low concentrations in liquids is a important issue in many different fields. Among others, it can be especially relevant for in environmental analysis. Additionally, the detection of impurities in solutions is very important, for example, in the semiconductor industry. Here minute impurities in the precursor solutions can lead to major failures during pruduction and processing. Despite the need for a sensitive and reliable method for the detection of impurities, the in-situ measurement of impurities at very low concentration is still challenging. Conventional methods, such as the optical measurement of scattered light, are not sufficiently sensitive. Other methods for the detections of impuruties, such as ion chromatography, are generally more complex to apply and can not be carried out in situ. The present invention describes a sensor system which allows to analyze impurities dissolved in a liquid down to the sub-ppb concentration range. The measurement is based on an optical method, in which the measurement of the impurities concentration is carried out within an extremely long optical path, which is built inside the sensor unit. The design of the sensor unit allows for a strong miniaturization allowing for its use, for instance, in lab-on-a-chip devices. This detection system has been shown to be particurlarly efficient for the detection of metal complexes in water solution. The invention can be used in all fields in which a high detection sensitivity for impurities in a liquid is needed. In particular, it can be used for enviromental analysis, und process monitoring in the semiconductor industry. The sensor system can be efficiently miniaturized, allowing for its use in lab-on-achip devices. The product is available for the market. 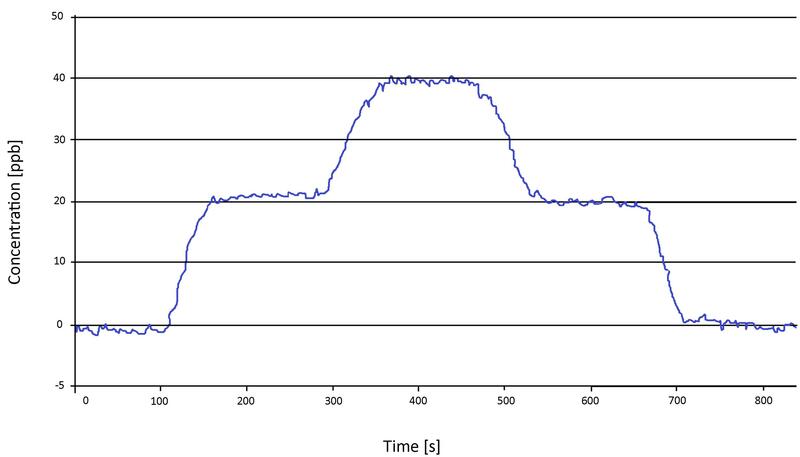 Figure: Time-dependent continous flow measurement. EP 2 486 388 B1, CN 102713563 B, US 8,948,563 B2.